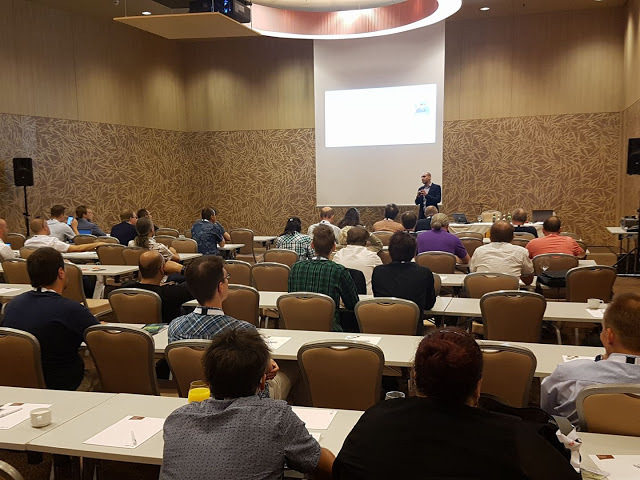 Last week (on June 20th) I presented a session about the Oracle Database Locking Mechanism at the Austrian Oracle User Group (AOUG) conference. This event took place in beautiful Vienna and was my first attending this event. It's a small, one-day event . There were 180 attendees - small, but still very fun well-organized. I particularly enjoyed the keynote of Maria Colgan & Gerald Venzl (both Product Managers for Oracle) about Oracle Database 12c and DevOps - it was a very amusing show in which Maria played the role of the DBA and Gerald played the role of the developer and together they showed how they can work together happily by leveraging Oracle Database 12c features and technologies. Another session that I particularly enjoyed was presented by Maris Elsins about Mining the AWR and how to find alternative Methods for Identification of the Top SQLs in order to address various performance issues. You can find in event page links to my presentation as well as other presentations from this event. I'd like to thank everyone who attended my session, and I hope to see you again next year.